Figure 1: The steps to obtaining an image using massively parallel X-ray holography. The sample consists of an object with a URA next to it. The coherent diffraction pattern is recorded on a CCD and Fourier transformed (with an Hadamard transformation) in the computer. The holographic term is isolated and further transformed to recover the image. Figure 2: (top) A URA hologram of a Spiroplasma melliferum bacterium cell, recorded with a single FLASH pulse at 13.5 nm wavelength. (bottom) The reconstruction of the image after decoding the hologram and applying further phase retrieval to achieve resolution beyond the 150 nm resolution of the URA pattern. The final resolution was 75 nm. The scalebar is 4 μm. The ultrafast pulses from short-wavelength free-electron lasers (FELs), such as FLASH, give us the possibility for imaging processes on the timescale of atomic motions. The upcoming X-ray FELs such as Linac Coherent Light Source and European XFEL will additionally allow us to probe dynamic processes approaching inter-atomic length scales. For many such experiments it is necessary to extract spatially-resolved information from a single pulse since sample damage may prevent stroboscopic methods. We have developed an extremely photonefficient method to form a real-space image of the object. Borrowing concepts from X-ray astronomy, our method of “Massively Parallel Holography” utilizes a special kind of coded pattern called a uniformly redundant array to form a hologram of the object. 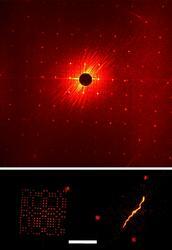 We showed that the pattern amplified the holographic signal of a bacterial cell by three orders of magnitude. This coherent imaging process also has the advantage of providing absorption, refraction, and depth information of a hologram. 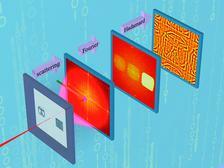 Recording single-shot high-resolution ultrafast images with a FEL offers several challenges. Since generally the object is destroyed by the FEL interaction (unless much less intense pulses are used to stroboscopically image repeatable processes) there is no second chance to improve the image, for example if was out of focus. High-resolution X-ray lenses might not survive the damaging pulses either. Lensless methods overcome these problems, and furthermore provide a path to reach near-atomic resolution with future sources. We have successfully developed single-shot coherent diffractive imaging , in which the far-field coherent diffraction pattern of the object is recorded. 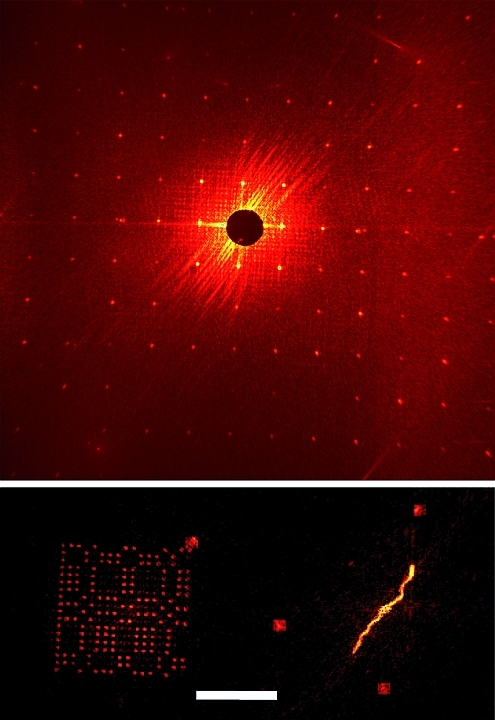 Using phase-retrieval methods, the diffraction pattern may be inverted to give the complex-valued image. Such retrieval methods require a minimum scattered signal to obtain the highest resolution. Adding a reference structure that is located close to the object of interest can essentially amplify the measured signal [2-4]. This is, in fact, the method of Fourier transform holography (FTH) [5,6] which also has the huge benefit of encoding the phases in the diffraction pattern. We extend the method of FTH by using a specially designed reference pattern called a uniformly redundant array (URA) that boosts signal by three orders compared with a single reference source, without sacrificing resolution. A Fourier transform hologram is the interference between the light scattered from the reference structure (usually a small pinhole) and from the object. A simple Fourier transform of this pattern produces an image of the specimen convolved with the pinhole. As in a pinhole camera, the image is weak and the signal to noise ratio (SNR) of the image increases as the pinhole increases in size at the expense of image resolution. We may deconvolve the effect of the pinhole (using phase retrieval) but the Fourier spectrum of a pinhole has regions of zero intensity which actually mask out the object signal we are trying to enhance. We overcame this by using a URA, which has the interesting property that all inter-pinhole distances are equally represented . As such, it has a flat power spectrum without zero intensity regions. Importantly, the gain in flux compared with a single pinhole is given by the number of open elements in the URA, equal to 162 in our FLASH experiments. (We have subsequently produced arrays with over 9000 active elements.) The image may be retrieved directly by convolving with the dual of the URA, to the resolution of the URA pitch, which we extend to the limit of our detector by phase retrieval. The steps to obtaining an image using massively parallel X-ray holography are shown in Fig. 1. In our experiments at FLASH, we focused a 13.5 nm wavelength pulse with 1012 photons onto a sample consisting of a helical Spiroplasma melliferum bacterium next to a 162-element URA that was milled into the silicon nitride membrane using a focused ion beam. The reconstructed image, shown in Fig. 2, demonstrates the feasibility of imaging micrometer-sized biological objects with a FEL pulse. The resolution of the retrieved image was 75 nm. We are planning to use this method at FLASH to achieve the highest possible imaging resolution of non-repeatable dynamic processes . H.N. Chapman et al. "Femtosecond diffractive imaging with a soft-X-ray free-electron laser", Nature Physics 2, 839 - 843 (2006). W. F. Schlotter, J. Lüning, R. Rick, K. Chen, A. Scherz, S. Eisebitt, C. M. Günther, W. Eberhardt, O. Hellwig, and J. Stöhr, "Extended field of view soft X-ray fourier transform holography: toward imaging ultrafast evolution in a single shot", Opt. Lett. 32, 3110-3112 (2007). S. Boutet, M. J. Bogan, A. Barty, M. Frank, W. H. Benner, S. Marchesini, M. M. Seibert, J. Hajdu, and H. N. Chapman, "Ultrafast soft x-ray scattering and reference-enhanced diffractive imaging of weakly scattering nanoparticles", J. Elect. Spect. Rel. Phenom., 166, 65-73 (2008). T. Shintake, "Possibility of single biomolecule imaging with coherent ampli fication of weak scattering X-ray photons", Phys. Rev. E 78, 041906 (2008). G. W. Stroke, "An Introduction to Coherent Optics and Holography", Academic, New York (1969). I. McNulty, J. Kirz, C. Jacobsen, E. H. Anderson, M. R. Howells, and D. P. Kern, "High-Resolution Imaging by Fourier Transform X-ray Holography", Science 256, 1009-1012 (1992). E.E. Fenimore and T.M. Cannon, "Coded aperture imaging with uniformly redundant arrays", Appl. Opt. 17, 337-347 (1978). A. Barty et al. "Ultrafast single-shot diffraction imaging of nanoscale dynamics", Nature Photonics 2, 415-419 (2008).